It was my ten-year-old daughter who first alerted me to the iconographic importance of the pomegranate. 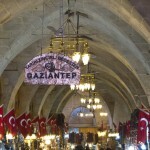 At Istanbul’s Grand Bazaar she pointed out the myriad trinkets—ashtrays, paper weights, ampules, candles, vases, key chains, pendants—in the shape of pomegranates. 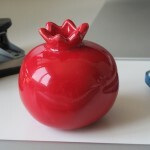 (She really wanted a ceramic pomegranate for her window sill, and I obliged her.) I wondered why the pomegranate was so favoured by souvenir makers, whereas there was no trace of any object in the shape of, say, a pear or a raspberry. I also recalled that last year, when I travelled to Armenia on behalf of Arastan, I had found that in this tiny country locked away in the Caucasus, the pomegranate is a much-loved, ubiquitous symbol that augurs fertility, abundance, and prosperity. It was everywhere, from friezes carved in medieval khachkars, to tabletop ornaments, to cheap fridge magnets sold at the airport. Baku is a metropolis that I can only describe as grand. Its buildings are grand, and its ambitions are even grander. 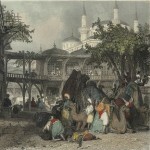 A meticulously restored medieval citadel – a warren of quiet cobbled alleyways enclosed by stone walls – is surrounded by a stunning urban landscape of impressive neo-classical buildings, wide boulevards and a multitude of fountains, all dating from the end of the 19th century, when Baku experienced its first oil boom. Here too, every brick and cornice has been painstakingly restored to its full splendour. And beyond and above all this neo-classical elegance rise awesome and highly futuristic new structures of steel and glass – the fruits of the current oil boom. 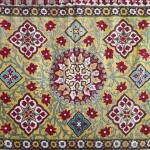 No single artefact can represent the silk roads, their legacy and the Arastan journey, better than a Suzani. 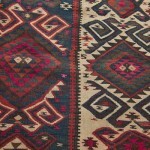 Arastan seeks out beautiful products with stories that often began on the fabled Silk Route. The suzani is one such perfect story of an enduring craft that has forever bound into every stitch and motif the hopes, aspirations, dreams and fears of its makers who lived in what was perhaps the harshest landscape in the world. See Arastan’s selection of vintage and new suzanis, or read on to discover more about the culture and traditions behind this wonderful craft. Come, Come, Whoever you Are Wonderer, worshipper, lover of leaving. It doesn’t matter. Ours is not a caravan of despair. Come, even if you have broken your vow a thousand times Come, yet again, come, come. And they did come … at the turn of the last millennium, travellers, traders, nomads, empires, swept into Iran and Anatolia from Central Asia and beyond. 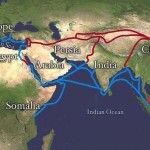 The Silk Road was never one long road. Rather, it was a series of smaller land (and later, maritime) routes, which formed an intricate network between the Occident and the Orient. 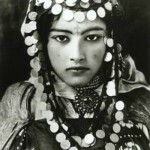 It linked Europe, India and the Far East via Central Asia. Take a look at this map, and you’ll see that Somalia, Thailand and even Indonesia were en route. For over one thousand years, these ancient pathways were the most important and best-known route in the world, transporting not just silk but all manner of exotic goods such as pepper, jade, glass, oranges, peaches, crossbows, gunpowder and rhubarb. Everything about Morocco is intriguing… especially to someone like me who has never been there. The gorgeous tilework, the latticed windows, the tadelakt lamps, the tribal kilims… ahhhh, I want to go there…. Now!!!!!!! 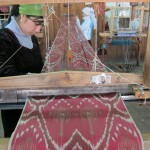 Margilon (formerly known as Margilan) is the heart of the silk industry on the Silk Route. We made it to the town bright and early to see the entire process of weaving and to visit renowned weavers. While the town still maintains traditional methods of rearing, spinning, dyeing and hand weaving, mechanised looms have also emerged. As most of the fabric is exported out of the country, there is a growing emphasis on the revival of traditional patterns and use of only natural dyes. We moved from a factory to a medressa and saw a lot of women involved in weaving ikats – and they were happy. They listened to upbeat Uzbek music on their tiny recorders, took their tea breaks and even played with their kids while they wove complex, intricate patterns.